For those of you whom haven't been to ASIA, I do wana let you guys know that it's important to try the KING OF FRUITS aka. DURIAN! Information on How to Cut it ! It's like banana pungent avocado, sweet and a little hint of bitterness. Ever wondered how to cut open a Durian? Living in Malaysia, known as the king of fruits, Durian, is also famously known to be most favourite fruits among asians and especially us Malaysians. Despite it being stinky, we still love the Durian flavour and it not only taste like avocado plus banana texture but also with a sweet bitter taste in it. Durian is such a unique cute with such a flavourful taste and that is what makes it so special in Malaysia and Asia. The first time asking my foreigner friend to cut open a Durian, and seriously He literally chopped it ! cut it into half instead of cutting open it ! 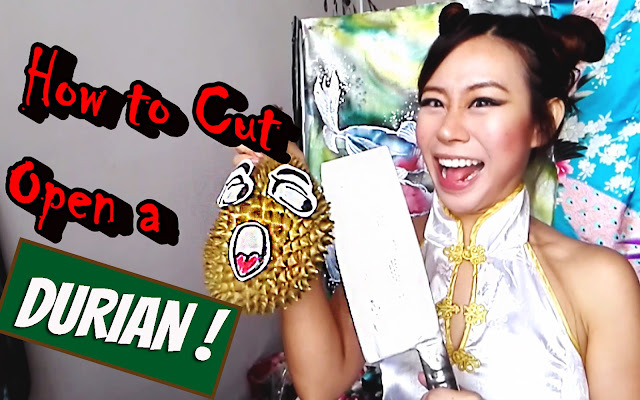 Here's a video where I not only opened the Durian in my Asian kungfu way but also an entertaining way at least you won't get bored of the usual HOW TO Cut tutorials~~ So, if you ever come Malaysia or Asia, Do not only Try this Fruit but take it as a Challenge to CUT Open this Fruit !! It will be a hell out of an experience I bet you for sure !!! PS: Don't use it as a weapon ! It's letheal ! !